Are you still looking for a high quality and inexpensive sling? we believe you will be hard pressed to find a premium quality sling system with the usability and durability of this sling .This is why we designed this sling for firearm enthusiast who want an awesome sling that is versatile and good value. It will last a long while by how it's made. Great breathable shoulder pad prevents shoulder strain, allows you to carry comfortably. ALL METAL HARDWARE: Cheap plastic components can crack or break just when you need them most. 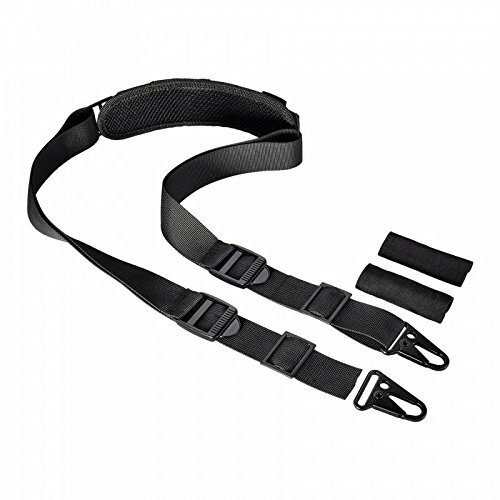 Boosteady rifle sling is fitted with metal clips for a lifetime of use. LENGTH ADJUSTABLE: It adjusts from 30"- 66". Whether you're climbing up to your tree stand or on military patrol, BOOSTEADY gun sling make it easy to get just the fit you need. REMOVABLE SHOULDER PAD: Provides better grips, reduces slippage and prevents shoulder strain, allows you to carry comfortably. BUY WITH CONFIDENCE: Life time & money back guarantee. Good value durable high quality. If you have any questions about this product by BOOSTEADY, contact us by completing and submitting the form below. If you are looking for a specif part number, please include it with your message.